Last year, William and Laura Baird got rid of half of their kids’ toys, half of their kitchen’s contents and a third of the family’s clothes. It wasn’t just de-cluttering — they also ditched almost three-quarters of their home’s square footage. Last year, William and Laura Baird got rid of half of their kids’ toys, half of their kitchen’s contents and a third of the family’s clothes. It wasn’t just de-cluttering — they also ditched almost three-quarters of their home’s square footage, moving from a three-bedroom house into the 440-square-foot cabin on wheels that they share with their three children, three cats and a hamster. Living with less is the philosophy behind the tiny house movement — the rising popularity of scaled-down homes, usually less than 500 square feet, some as small as 80 square feet. Living in these small spaces does mean less responsibility (low prices means many are mortgage-free) but a growing group of tiny-house dwellers are far from rootless vagabonds. Like the Bairds, they’re parents with young children. 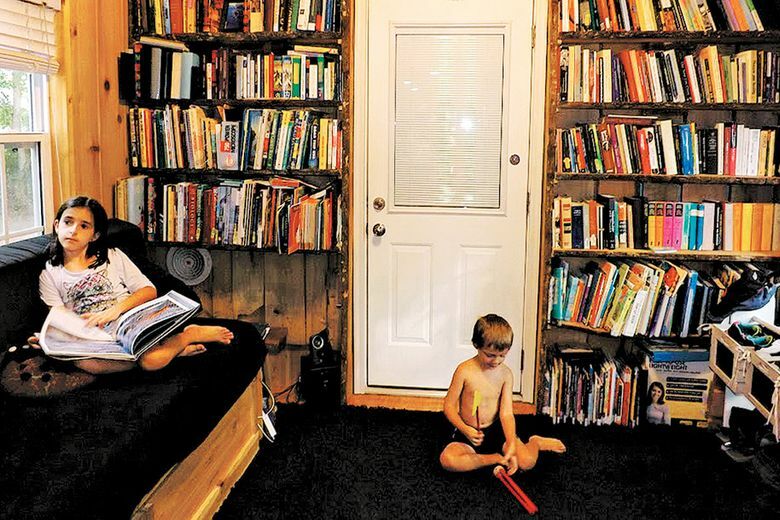 Laura, a nature educator at a state park, and William, a philosophy professor, have gotten creative to maximize space in their new home, which is parked in a campground in Myrtle Beach, S.C. (They plan to eventually move it to their own land.) They’ve built a fold-out table for family meals, installed bunk beds for their 8-year-old twin daughters and designated their 4-year-old son’s sleeping loft as the playroom. Laura even ripped out wall panels in the kitchen to build a spice cabinet when she discovered 3 inches of wasted space. The family is still trimming down their belongings and settling on where to store things (bulky towels are especially challenging), but the parents like that they spend more time together as a family, and more time outdoors. Eight-year-old Jessica Baird agrees that the smaller space has brought the family closer. Her favorite part of living tiny: “Every room has at least one cat in it,” she says. In addition to having a roomy common area, Diedricksen suggests thinking about privacy, including isolating adults’ sleeping space and insulating interior walls so everyone can get some peace and quiet. Other tips when designing a tiny family home: Don’t skimp on windows — they make a small space feel less claustrophobic — and plan for storage, including offsite space if necessary. Diedricksen recommends storage sheds, which can double as offices or even playrooms in a pinch. As kids grow, tiny houses can become especially challenging, so some families add separate dwellings for teenagers. Tiny-house designers Andrew and Gabriella Morrison built their 15-year-old daughter a 120-square-foot cabin and their 19-year-old son a 160-square-foot treehouse near the family’s home. “If parents have a good, open relationship with their teens and teens are making good choices, it’s OK to create a separate sleeping space for teenagers where they can be and have their friends over and give the parents privacy too,” Gabriella Morrison says. The couple, who run the website TinyHouseBuild.com, live in the modern 207-square-foot house on wheels that they designed in Ashland, Ore. They warn that while living small is rewarding, families used to a larger home should prepare for an initial adjustment — and shouldn’t panic when things get tough. The Morrisons say small-scale living has also helped them work less and travel more. Better communication is a benefit that the Bairds say they already recognize from their family’s year in the cabin.